Anacortes Yacht Club: AYC Takes 1st & 3rd in Swiftsure! 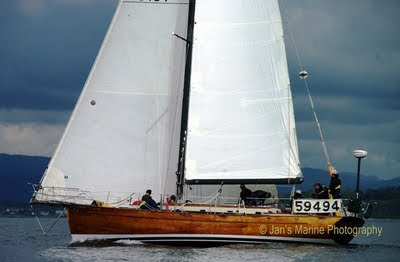 The news is just in -- AYC boats take 1st and 3rd, plus line honors in the 2011 Swiftsure Lightship Classic! Doug Fryer's Night Runner and Kevin Welch's Icon took 1st & 3rd respectively in the 2011 Swiftsure, with Icon also winning the City of Victoria trophy for the first to finish! The race started in light winds and adverse current, with most boats footing off for Albert Head to avoid the strong flood at Race Passage. Icon was the first to reach Race Passage followed by the rest of the big boat fleet. Most boats, including Night Runner elected to work the Canadian shore, with Icon switching over to the US short near Sooke. Icon worked up the US shore steadily putting time on the fleet, Night Runner stayed on the Canadian shore until punching out into the middle mid-strait. Icon rounded Swiftsure Bank around midnight in lumpy seas and moderate swells. Night Runner rounded about 8 hours later early in the morning. Both Icon and Night Runner stayed in the middle of the Strait throughout the night. On the way home Night Runner managed to stay ahead of many of the big sleds until the winds built. Icon on the other hand, being so far ahead had extremely light winds until shortly before Race Passage when they built to a maximum of 18 knots. The winds continued to build for the later boats, hitting 35-40 knots late in the afternoon. In the end Icon took line honors by about 3 hours over Strum, Rage and Neptunes Car (taking 1st in Division One & the City of Victoria trophy for first-to-finish in the process), but not enough to correct over Night Runner who finished first overall and first in Division Two! A great (and long) couple of days on the water for AYC boats -- congratulations to all for a job well done!